Want smooth, straight, glossy locks? 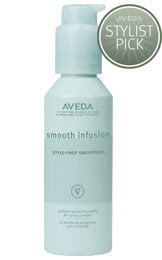 Then turn to Aveda Smooth Infusion Style-Prep Smoother. An exclusive plant infusion -- a blend derived from organic aloe, maize and guar bean -- creates a smooth surface, while organic tapioca works to combat humidity. And it smells amazing -- the fresh, spicy citrus-floral is created from organic bergamot, palmarosa, Bulgarian rose and Australian sandalwood. Sounds divine, right? Well, two winners have the chance to win a bottle today, valued at $24! To enter, place your name and email address in the box below -- if you can't see it, leave a comment with your name and email, as ContestMachine is having some major issues today! The winners will be selected on Saturday, August 28 and notified by email. This giveaway is open to US residents only. Giveaway runs until Friday, August 27 at midnight. One entry per person, email address and IP address. Multiple entries will be disqualified. Wow that sound is really nice. I want to try it once. I love Aveda products. Would love to try this! Everything Aveda makes is amazing! Smells like sandalwood? Automatic winner with me. I didn't see a box to leave my email so hopefully this will count too! no box for address so I will just leave my email then you can get in touch with me! Love to try this, sounds great! Your box isn't loading properly. I would love to try it! Looks great! love this product, smells fantastic! No box for entry so I hope this works.